This top-down PS1 shooter has the player scouring a doomed space station for self-destruct switches that need activating before the resident viral epidemic can reach Earth. It can be played in two-player mode which is the same but one more player. In effect you're going to bust through hordes of the un-mourned infected guns spitting out death through 10 medium-sized levels whose layout can only be described as "why was it a good idea to make everything into a labyrinth?". The game was created by one man in just four weeks using a special PlayStation developer kit released to the public in 1997. Best Co-op time: 0:07:54 by Martin 'J.Y' Söderhäll and Dan 'DanE' Söderhäll on 2015-01-10. Created by Ben James in a mere four weeks, Psychon is a top-down 2D shooter taking place on a space station. A deadly virus known as Psychon is spreading like a wildfire and threatening to make it's way to Earth and your job is to activate the self-destruct system and escape the space station before it's to late. 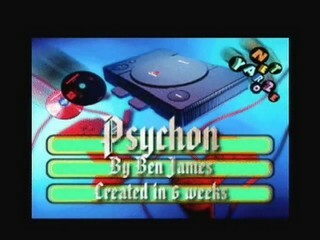 Psychon is one of many home-brewed games made with the PlayStation development kit Net Yaroze. Released in 1997, Net Yaroze made it possible for the common man to develop games for the PlayStation at home. Net Yaroze programmers had access to forums where they could share their projects with others, and some games even made it to OPM's demo discs. Although there were a lot of fun and interesting homebrew games that saw an "official" release, Psychon is probably the best Net Yaroze game to be released in Europe. Psychon appears on at least two OPM UK demo discs (37 and 42, which has a special Net Yaroze HoF collection with 14 games on the same disc). Apart from a couple of small changes in the music and sound effects both versions seem to be more or less identical. For this run, we played the original version featured on demo disc 37. Since this game has a great co-op mode, we decided to go for a 2-player run instead of the usual single player mode. Co-op mode is exactly the same as one-player mode, the only difference being that player one (J.Y) is purple and player two (DanE) is green respectively. There are a total of 10 levels in the game and the goal of each one is simple: activate the four self-destruct switches and head for the exit before the time runs out. Gameplay is almost equally as simple: you basically just run and shoot everything in your way. Besides from making sure that ammo and health is sufficient, the blue dots representing keycards are also utterly important. The first time we were in the making of a run, we encountered problems about halfway through the game as we couldn't open the gates. Upon discovering that the blue dots were keycards and not some kind of bonus points we figured out strats for picking up enough keycards to make it all the way through the game without having a huge amount of extra cards or having to diverge from the route. The route itself is pretty much as optimized as it can be, and despite some small mishaps along the way the speed is maintained throughout the run. Intentional suicides are used in later levels, although the simultaneous suicide late in level 8 was not intended. Another useful trick is to remove the status bar at certain places in the game by pressing triangle. This makes it easier to spot enemies coming from the north. Thanks goes out to Ben James for creating this awesome game, and the people at OPM for letting it appear on demo discs.